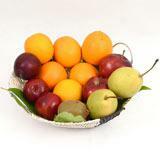 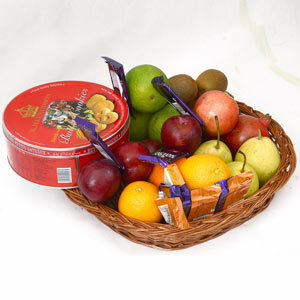 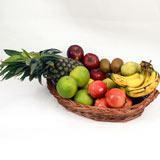 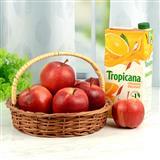 Make this fruit basket consists of 1/2 Kg Pomegranate, 1/2 Kg Apple, 1/2 Kg Plum, 1/2 Kg Sweet Lime, 1/2 Kg Kiwi, 1/2 Kg Pear, 1 Box Danish butter cookies 4 Pcs Dairy Milk Crackle and 4 Dairy Milk a great Gifts across India for your loved ones. 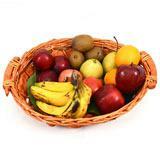 This gifts also can be paired with other food items such as dry fruits, sweets, and a lot more to name a few. 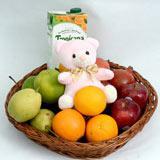 Your dear ones residing back in all cities in India will definitely be amazed to receive these gifts if sent through GiftsAcrossIndia.com.